The exterior of this handsome one story home is distinguished by both its unique rooflines and the combination of stone veneer and cedar siding. Wood is featured on the interior as well, including the use of exposed wood trusses in the great room and exposed beams in the dining room. The house can have two (if you’d like to have a home office, den or study) or three bedroom suites on the main level, and if you choose to construct the lower level there’s room for two additional suites as well as a huge recreation area with a wet bar. A covered entryway supported by tapered stone–clad columns leads to a foyer space large enough for furniture and/or built–ins. Double doors on your right open to an office/bedroom/study with an (optional) fireplace at the far end, and lots of windows for light and views. A door opens to a full bath that doubles as a guest powder room. On your left there’s an open stairway to the lower level, and straight ahead you pass a coat closet on your left and a vestibule that provides access to the master suite on your right before entering the great room. The great room has a dramatic vaulted ceiling with exposed wood trusses that help to make the room feel more intimate. There’s a fireplace on one wall that can be enjoyed from the kitchen as well, and the rear wall is filled with lower and upper windows and sliding glass doors that open to a large deck that has open and covered areas. This room enjoys terrific light and views during the day. Open to it is a spacious kitchen that has a large utilitarian central island with sinks on top and a dishwasher below, plenty of counter space, and a walk–in pantry. Like all the rooms on this level except the great room and the dining room, the ceilings are set at a lofty 10 feet. Next to the kitchen is a dining room that has two walls of windows, and glazed sliding doors in the third wall that provide access to the covered and open deck. Exposed wood collars at the ceiling add a rustic feeling to this room. From the kitchen, a small hall leads to a guest suite that has its own full bath, and sliding glass doors that open onto a partially covered private outdoor deck. Also off this short hall is a mudroom with a built–in bench and storage lockers, and hooks for coats. Three doors in the mudroom open to a laundry room, a powder room, and an oversized three–car garage. The remainder of the house is devoted to the master suite. The master bedroom has a tray ceiling, a trio of windows for light and views to the rear, and a door that opens to the covered portion of the rear deck. A two–sided fireplace is located between the bedroom and the master bath, bringing firelight and warmth to both rooms. The master bath features a large tub located in a light–filled corner, a separate shower, a private toilet room, two vanity sinks, and access to a walk–in closet. The lower level includes an open recreation room with a corner fireplace, a large space for billiards or other games, and a full wet bar. This room is an ideal space for entertaining guests, and includes sliding glass doors that open to an outdoor patio. To the right of the recreation room there’s a hallway that passes a long window seat and a full bath before reaching a guest bedroom. The guest room has its own private vanity sink outside the full bath, and a corner filled with windows. The left wing has another guest room with a private full bath, and a bedroom with views to the rear and sliding glass doors to access the patio. There are also two huge unfinished storage rooms, one of which can access a vault space. This is a beautiful one–story home that if built on a hillside can also have a walk out lower level. 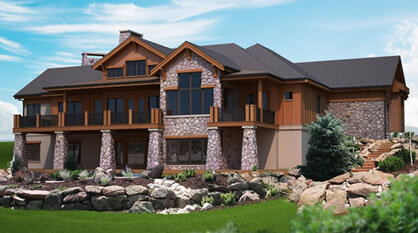 Wood detailing is featured inside and out, and the house offers great views to the rear. If built on a flat lot, there's room for at least two and easily three bedrooms. The dining room has a vaulted ceiling, and because it protrudes from the rear of the house, it enjoys views in three directions. There are fireplaces in the great room, the master bedroom (a two–sided unit that's also enjoyed from the bath), and an office that's set at 45–degrees to the rest of the house.